For all it’s techo-babble and computer wizardry, there’s something very old-fashioned about Person Of Interest. Like the suits Mr. Finch wears, which, combined with the glasses, make Michael Emerson look like he should be working Mission Control at NASA in the 1950s. (It’s funny, those glasses should be hip, but Emerson, with his limp and his perpetually startled expression, out Kents Clark.) Or, even more crucially, the premise of the show itself. Once upon a time, Finch designed a magical machine that would process all of the government’s intelligence information on its citizens and then determine likely terrorist attacks. But the machine didn’t know how to distinguish between “terrorist” and “garden variety creep,” so it started spitting out (get used to that phrase) the Social Security numbers of people who were about to be involved in violent crimes. Now Finch, with the help of his pal Reese, uses those numbers to stop crimes before they happen. Which is all well and good, but the assumptions this requires us to make are the sort of assumptions that would’ve been easier 50, 60 years ago. Like, that it’s an unquestioned good thing that a computer (and the government) have access to every telephone call and e-mail people make. Or that Finch and Reese are using this power purely in the interest of others, illegally spying on strangers in order to save their lives. It’s a situation that could be played for ambiguity, and it’s still possible that Person Of Interest could try that route down the line. Emerson is, of course, ambiguity personified. But most everything in “Ghosts” was straightforward, even with the flashbacks (a show with Emerson, a computer with magical numbers, a cameoing Brett Cullen and flashbacks? Heaven!). I mean, part of the story hinged on a middle-aged man spending a day in a hotel room with a teenage girl runaway, and nobody blinked an eye. That’s operating on a not-quite-modern sensibility. “Ghosts” wasn’t so much a step up or down from the pilot as it was a step sideways, largely maintaining that first episode’s strength and weaknesses. Because we didn’t need to spend so much time on an origin story (although dig that clunky expository dialogue! ), we spent more time on the Person of the Week, the aforementioned teenage girl, Theresa. But by the end of the episode, we still knew barely anything about her. Last week introduced the idea that the SSNs the machine provides might be for potential victims or potential killers, but Theresa is on the side of the angels. Her father, mother, and brother were killed by a hitman a few years back, and Theresa herself was presumed dead; there’s a brief tease at the beginning when Finch and Reese meet in the graveyard where the Whitakers were buried, and Reese says something about a ghost (sigh), but by and large, this is a straightforward, land-deal-gone-bad kind of story. That’s a problem, and it’s one of the two big problems I have a sneaking suspicion the show is never going to get around to fixing. Every element of this PotW was generic, and it’s frustrating because it didn’t have to be. With a premise this weird, the series doesn’t need to pull out a lot of overly-complicated (and yet still tedious) double-crosses and white-collar crime. There’s nothing in Theresa’s life that couldn’t have been done roughly as well on any other of a dozen different procedurals, and, apart from the action set-pieces and a not entirely terrible climax, this played like filler. The personality all comes in around the edges, and the show needs more of it. It’s called Person Of Interest: Would it be too much to ask to find actual interesting people? 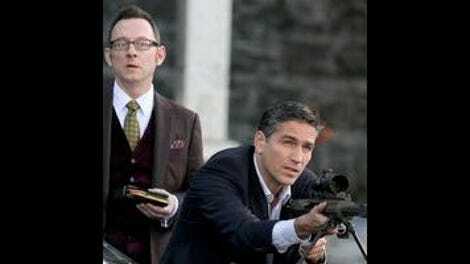 Jim Caviezel continues to be a black hole in the guise of a leading man; he’s clearly trying to play Reese like a man whose only remaining response to despair is sardonic contempt at the world and occasional punching, and while there’s nothing wrong with that in theory, he doesn’t have the energy to make it work. And the show seems to realize it. 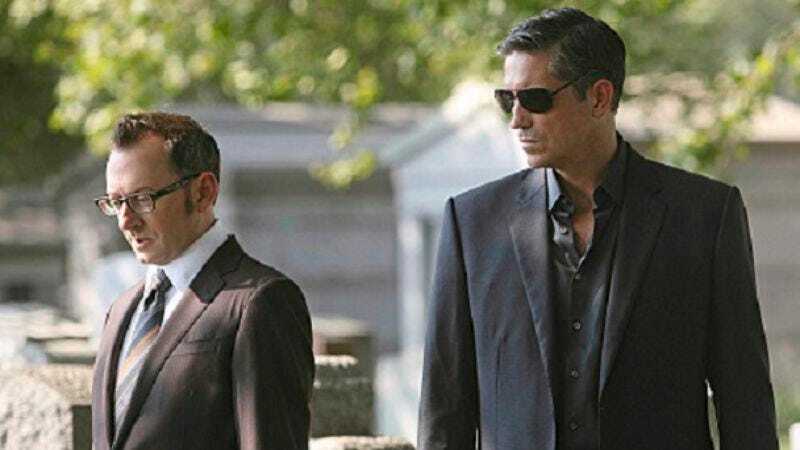 While I would normally expect Reese to be PoI’s nominal lead, “Ghosts” seems to subtly shift more of the focus onto Finch, giving him a pair of flashback scenes and the episode’s climax. The split is still very close (Reese is, after all, the one who shows up in the nick of time to save the day, which is some silly, lazy writing, by the way), but you get the sense that the writers, realizing they’ve got Emerson to work with and that Emerson can make all but the clunkiest of lines sound like they’ve got more going on under the surface, are trying to make sure they give him as much of the heavy lifting as they can. Thankfully, he makes the most of it. As of yet, Finch won’t be going down in history as one of TV’s great oddballs, but he at least manages to spice up what would otherwise be a wholly average hour. There’s the limp, which increases or decreases depending on the context, and that goofy, stuck up haircut, and there’s the fact that he works at a menial position in a company he secretly owns, taking abuse from his supposed boss and hiding in a cubicle when he isn’t out trying to save lives. The idea of a man who made a machine that can watch everything, who decides his calling in life is to spy on people for their own good, and yet is terrified of leaving any kind of trace: That’s cool. Plus, there’s a little bit of history tonight: It turns out Finch had another partner, back when he was building the Machine, and that partner noticed all the non-terrorist crime the system was tracking and freaked out over it. Also, that partner is dead, and there’s a memorial bust of him in the lobby of Finch’s building. Presumably, a great power/great responsibility situation is brewing in these flashbacks (all from 2002), and while nothing here tells us that much that we didn’t already know, it’s a start. As for the rest, well, the fight scenes continue to be enjoyably brutal (although they use the “you think the bad guy is going to shoot someone but then Reese shoots him from off-screen just in time!” trick twice, with the same bad guy both times), and the first scene of the episode, which has Reese saving a cheating husband’s life, was something I hope we see more of; it’s great for world-building (because it gives us the sense that Reese and Finch take care of a lot of cases, and we only see the most difficult ones), and it’s also just plain fun. While I’m not a huge fan of the cop who’s determined to track Reese down plot, at least there wasn’t much of it. Right now, this qualifies as passable but only intermittently inspired; I’m hoping the inspiration takes over soon, or this will settle into a middle-of-the-road rut. There’s nothing much interesting about ruts. I can’t decide if the fact that the hitman was using roughly the same technology to track Theresa as Reese and Finch were was an intended parallel or just based on the assumption that everybody has access to magical technology.